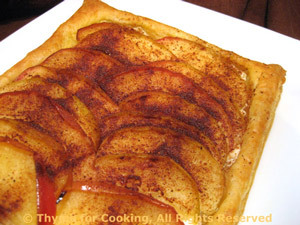 Easy Dinner: Potato Soup with Apple Tarts, Weekly Menu Plan. Another simple, fairly quick soup for dinner. This makes enough for 2 meals - have some for lunch or freeze. If you prefer a very thick soup, add less water to cook in (should be enough to just cover everything) /or milk to finish. 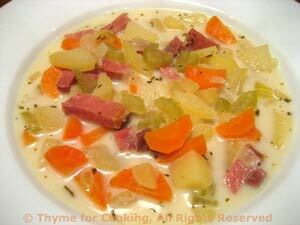 A soup with as many variations as there are cooks: some like it puréed, some thicken it with flour; some like it thick, some thin; some use carrots, some wouldn't think of it. This is mine.... at least, today's version. Peel carrots. 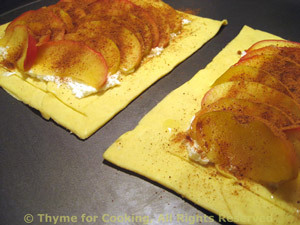 Slice by cutting in half the long way (in 2 or mores sections) then into half circles. Melt butter in small soup pot or large saucepan. Add onion and sauté until it starts to get tender, about 5 minutes. Add carrots, potatoes, cauliflower, herbs and water. Cover and cook until vegetables are tender, 30 - 40 minutes. To finish: remove bay leaves. Add milk and heat through. Serve. Note: You could substitute cream for some or all of the milk for a richer soup.